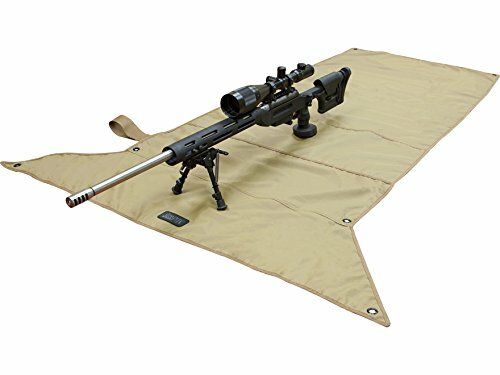 Shooting mats are very seldom thought of when thinking of must have pieces of gear when shooting prone, that is until you have to shoot prone without one. 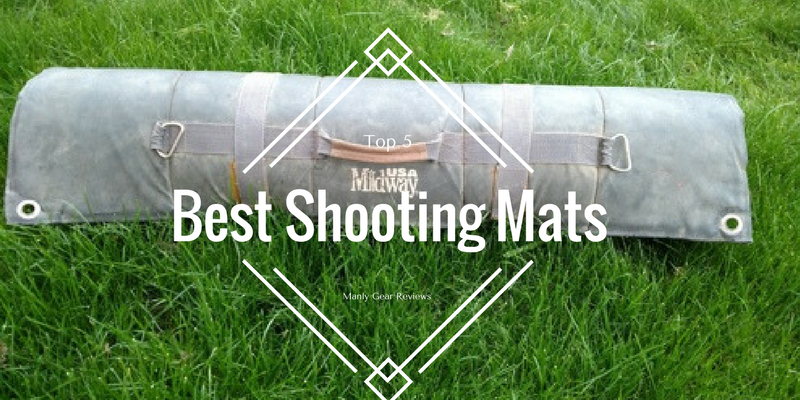 Find out why the Midwayusa Competition Shooting Mat received our Editor’s Choice award along with how the other mats stacked up. Shooting mats are one of those pieces of gear that has become as important to me as bringing ear protection. Ok fine, if I forgot my shooting mat I’d still shoot for the morning but it definitely wouldn’t be as enjoyable. Weight and Size: Depending on where you do most of your shooting, weight and size should be a huge consideration. If you are able to park your truck right next to where you shoot then going with the biggest, most padded shooting mat may be the best route to go. If you are a hunter or PRS style competition shooter, going light and mobile with minimal padding would probably be the best way to go. Material: One thing to consider when looking for the best shooting mat is the material. The material can have a huge affect on where the mat is best used. Is the mat going to receive a lot of direct sunlight? Is it going on top of moist ground or snow? These are all things to consider because if your mat is too scorching hot to lay on because of direct sunlight or has soaked through due to snow the mat is no good to you. Padding: This is mostly in direct relation to weight and size. Most of the shooting pads we reviewed have a the bare minimum a very dense layer of padding. Others have much more padding which lead to longer, more comfortable shooting sessions. These shooting pads were of coarse larger and heavier as well. 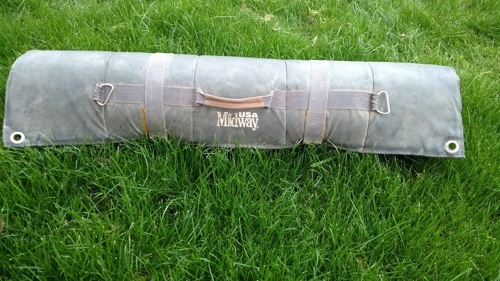 The Midwayusa Competition Shooting Mat has been my goto mat since Nov of 2010. This mat has seen years of local PRS matches, hundreds of trips out to the desert, shooting trips in the snow, the AZ sun and all over in Utah. This mat utilizes two velcro straps and rolls out like a sleeping bag. Deployment couldn’t be quicker. As you c an see in the pictures, this mat has been heavily used. On the front towards the top and around the knee area you have a rubber type material that is extremely grippy. My favorite feature is near the front of the mat. There is a sewn in strip of nylon that works as a perfect barrier for loading a bipod. I have found that my groups shrink and I can stay on target much better when loading my bipod before a shot. On the back, you can see the mat is very much in one piece and doesn’t even have a rip in it! It is extremely dirty but after 6 years of use I’d say its held up just fine. The velcro straps even still hold. Padding on the Midwayusa Competition Mat has proven adequate for shooting on concrete surfaces, truck beds and on crushed granite (which we have primarily here in the AZ desert). The pad is surprisingly light weight although it does not necessarily roll up super small. One thing to also keep in mind is the rubber areas can get hot if sitting out in the sun, I combat this folding half the mat on top of itself to help shield from the sun. 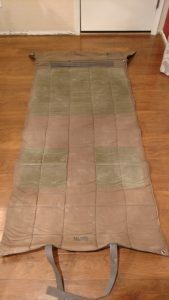 When taking into account the years of use this shooting mat has endured and the comfort levels it has provided to me and many other shooters, we feel confident in saying this is the best shooting mat. For shooters on a budget, you aren’t going to do much better than the Midwayusa Packable Shooting Mat. The main draw to this mat is the fact that its around 30 bucks and also packs up nice and small. This mat features a nice canvas like material that does not get super hot in direct sunlight. Grommet holes on all four corners all the mat to be staked down for extended shooting sessions or in high wind. This packable mat packs up small, barely bigger than the size of a can of monster. Keep in mind this mat has minimal padding to keep the size and weight down…and consequently the budget. 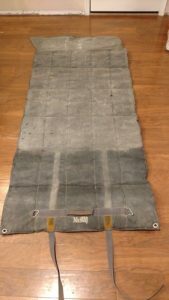 Shooters that need a light shooting mat, or shooters that just need an affordable shooting mat for the couple times a year they shoot prone, the Midwayusa Packable Shooting Mat is surely shooting mat on a budget. Wiebad is a small operation that has been making different pieces of gear mainly geared towards competitive long distance shooting (i.e. PRS style shooting). While they started off making cheek pads for Manners and McMillan stocks, they also make some of the best arm support bags as well as rear rests. Keeping with the everything you need, nothing you don’t theme of their other gear, the Weibad Padded Mat is a no frills compact shooting mat. The Weibad packs up nice and small. Geared towards hunting and competition shooting this pad is easy to pack and even easier to deploy with its single clip design. The Weibad also happens to be made in the USA! 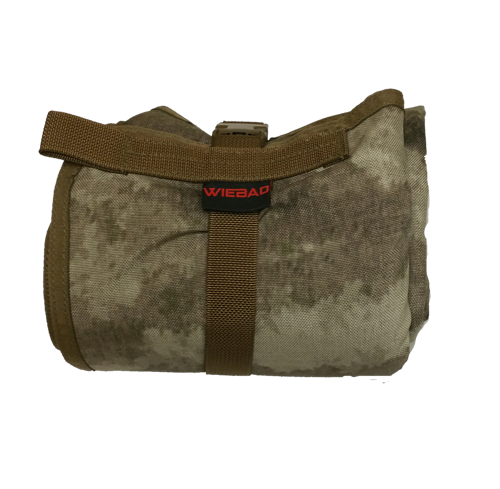 What makes the Weibad Padded Mat the best packable shooting mat is the fact that it weighs in at 1lb 6oz and also manages to have some padding in the elbow and upper body area. The Weibad will also do well in the rain, on wet grass and snow. 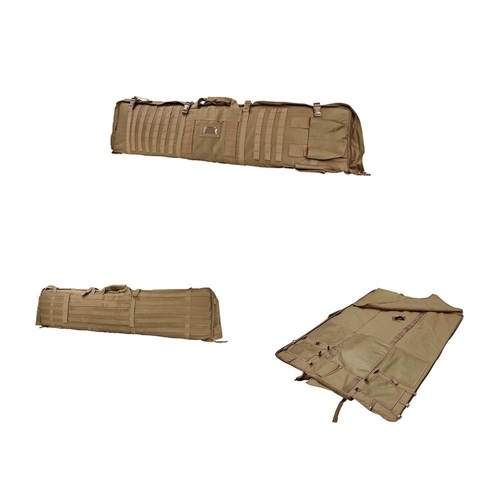 The Voodoo Tactical Padded Shooting Mat is a good shooting mat if you are looking for something in between a full size mat and a packable mat. The Voodoo Mat rolls up like a sleeping bag and is secured by 2 beefy buckles. What makes the Voodoo Mat unique is that elbow “wings” that deploy. This is a nice feature as the main problem with the packable mats is your body is usually fully protected by the mat but your elbows are in the elements. Utilizing a close cell design, the Voodoo is generous with padding. The Voodoo mat is also extremely weather resistant and can be safely used on top of snow for prolonged periods of time. NcStar has a whole lot going on with their VISM Rifle Case and Mat combo. The NcStar VISM has the capability to replace your range bag, rifle case and shooting mat all in one go. This mat (or case) can hold enough ammo and gear for a quick run out to the range if only planning on bringing one rifle. The NcStar is reasonably padded, definitely enough for an extended prone range session. It is also weather resistant and can handle laying on top of snow for prolonged periods of time.